Verdict: Despite its best efforts, “The First Monday in May” is more fluff than substance. 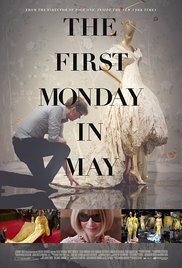 “The First Monday in May” doesn’t want to be a documentary about fashion. It has much grander ground to cover: what constitutes art, the morals of shock and spectacle, whether or not it’s cool to put Mao Zedong in the same room at Buddha. These are important questions, but “Monday” never gets around to answering them. It spends most of its time showing off the inside world of the Met Gala and the oh-so passionate people who work there. The doc follows Andrew Bolton, curator of the Met’s Costume Institute, as he puts together the 2015 exhibition China: Through the Looking Glass, exploring the influence of China on Western fashion designers. Director Andrew Rossi follows Bolton and his cohort– including Vogue editor-in-chief Anna Wintour and esteemed Chinese director Wong Kar Wai– as they navigate opinionated museum directors and antsy famous people in organizing the exhibition and the Met Gala. The opening and the Gala happen every year on the first Monday in May, a day so significant that it ranks with Thanksgiving, Christmas, and New Year’s as the only days the museum is closed. With an event so significant, you’d think we’re bound to get a fair bit of drama, but “Monday” stays cordial from start to finish. The doc’s mostly concerned with peeking behind the curtain at what goes into putting everything together. Scandal is tempered by quiet tensions over clipboards– remember, these people are too rich and famous to get nasty with each other. There are whiffs of conflict that never fully emerge, like the issue of fashion as Art. We learn all about status of fashion at the Met, how the Costume Institute lives on the lowest level of the Met and that this reflects its reputation in the art world. But is fashion really art? the film dost inquire. Its answer is a resounding yes, an answer it gives in the first twenty minutes and then, satisfied, spends the next hour glossing over. Once in awhile it will circle back to to reaffirm itself, but not often and not with any particularly juicy insights. Another underutilized point of interest is Bolton’s desire to top his past work, the hugely successful Alexander McQueen exhibition Savage Beauty. There’s dramatic tension here that could have been given more focus: a man trying desperately to top himself, worried he won’t make the cut (probably), terrified he’s already done his best work (I’m assuming), trying to prove his art is truly Art in the home of Van Goghs and Vermeers. Unfortunately this, like most of the really interesting stuff in “Monday”, is only occasionally touched on. Bolton looks concerned a bunch and spends his time being picky and making adjustments, but this doesn’t tell me anything about him except that he has an excellent work ethic. “The First Monday in May” tried. It asks some tough questions without answering them. It gives us an enticing character but doesn’t follow through on his potential. Nonetheless, I give it a respectable C. It fails no more than most narrative blockbusters do in character and plot development, and kinda makes up for it with an abundance of fancy stuff to look at. I’m partial to staring at pretty fabrics on elaborate displays, so I enjoyed myself just enough to give it a passing grade. If you can forget the fluff and instead enjoy the tole (and celebrity cameos), watch away.